Jordan Williams’ letter to the editor promoting the SM electoral system is deceptive. It claims that SM is a compromise between the extremes of the old First Past the Post system and MMP. But SM is basically another version of first past the post, with nearly all the bad points of that system. The votes of voters living in ‘safe’ seats would again be worthless while a few people in ‘marginal’ electorate would have great power over who became government. People who voted for smaller parties would be cheated, for instance only getting three MPs for 10% of the vote (when the fair share would be about 12). But the trickiest thing about William’s letter is he knows that, if New Zealanders vote out MMP, his SM system will not replace it. All the polls show that if MMP goes it will be replaced by First Past the Post. SM, besides having such an embarrassingly bad name, is a political trick to get people voting against MMP and ending up with the worst possible system for democracy. So, let’s introduce Jordan Williams better. He is the same Jordan Williams who was in the news earlier this year stage-managing Don Brash’s leadership coup when Brash took over the ACT Party. Leading supporters of SM besides Williams have been Brash himself, Ruth Richardson and the Business Roundtable. As we saw in a recent Gisborne Herald article, they were joined by the right-wing lobby group, Maxim Institute. SM is being pushed by a small faction of New Zealand politics. 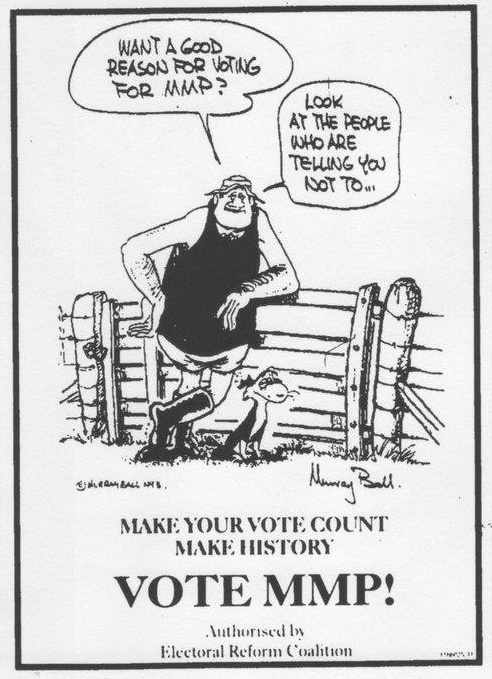 For the rest of us, the fairest and most democratic way to elect governments is still MMP. If MMP is retained this year, there will still be a full review of the system to see if it can be improved further. Yes, assume your audience is to stupid to think for themselves? Last time I looked the paid referendum campaign was: Labour+Greens+Mana+Maori Party+Unions versus one guy. too stupid? anyone can share their views, can’t they?